Hello, you’ve stumbled across my life! My name is Angie Stevens I’m now a grown up of forty five years old and this is my blog. As you can see it’s mostly drawn. A visual representation of my life! Go on take a peek, it won’t hurt…I started it when my youngest was only nine months old and I was in my own little box of foggy, sleep deprived misery. Lots of manic musings and drawings regarding my life and other such things, it really is a laugh although sometimes it may be me that’s the only one laughing…..This is my blog, a daily record of my life. I’m married and live in a little world of jaffa cakes and lego. I’ve been drawing this blog for nine years now. I started as a means of coping with post natal depression and the isolation that it can bring. I draw most days and I’m showing no signs of stopping. Thanks to this blog, I’m now a published author so from very small beginnings come big things. Thank you for stopping by. Well go on then! Go and look or I’ll start writing….or even worse, talking…. Hi Angie…it’s Debbie “Saturday- training- in- Singleton- Park -with- Gwerin” Tamplin aka Debs!! Loving the blog….the illustrations are GORGEOUS!! You really should get some books published. Hope Millie, Evie & Gruff are bringing you much joy as always & that you & Miles are well, has the cold gone? Will miss you on Saturday as we have the “Big Day of Moving” but I shall see you the following week armed with wand as promised!! Glad you’re enjoying. Looking forward to seeing that wand! Thank you! Welcome to my blog, I hope you comeback to see what we’re all up to in my little microcosm of Mummy chaos! Just need to let you know what it’s come to – my 7 y/o daughter is asking, “Mom! Can we please look up doodlemum?” hilarious. she surf’s your blog now all on her own. keep on! 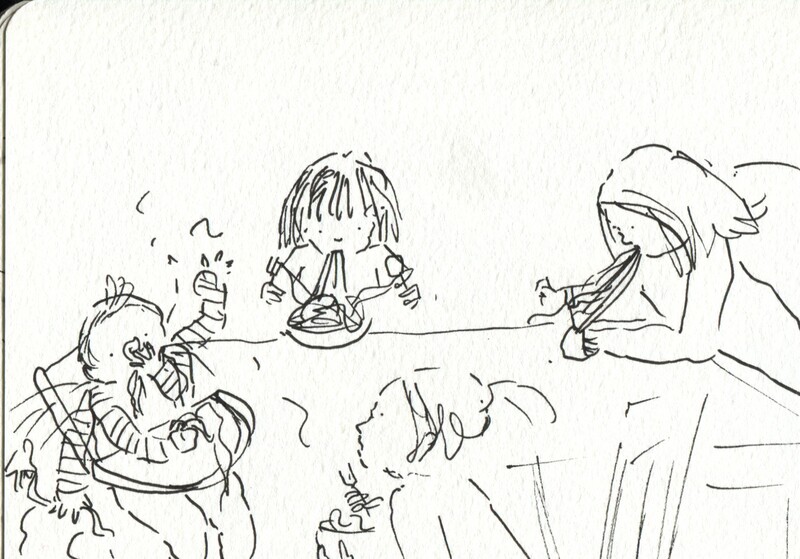 Ooops sorry about the recent shopping post….Millie reads my sketchbooks to her younger sister and I hear them both roaring laughing. I’m glad they can laugh at me and they think it’s hilarious they’ve become characterised. I’m very glad she likes them! Fantastic sketches! What a great way to sort out the events of the day and share them with the world. Thank you! My little 10 minutes (if Im lucky) of the day of drawing is precious, much better than a diary as my little ones can’t crayon this or gum it ! Yes I do. 🙂 Ive just exhibited a few of these posts locally in a pub with a collection of artists. A very belated “Happy Birthday” to you… and I hope you are feeling much better now. And the kids are gorgeous by the way, although I can see you have your hands full! Keep up the good work (I’ve subscribed… so I’ll be keeping up ok). Absolutely amazing! My husband and I are both looking at each other thinking if only we could draw like that. I love this – what a brilliant idea. And you manage to do that in 10-minute spots through the day? Stunning! Really lovely illustrations. Do you do book illustrations at all? I work in educational publishing and these would really go down a treat in some of the books I’ve worked on (note that it’s not normally down to me to do the commissioning, but could point people your way if you’d be interested, or indeed have the time!). I’ve sent a link round a number of designers I work with – hope something comes of it. And I’ve subscribed, now, and am enjoying the beaufiful pictures. Well thank you so much for your kind gesture. I hope you continue to enjoy my blog! And I’ve written a post about you, too, over at my blog. Used a picture to lure people over here, which I think seems to be OK under your CC licence, but do let me know if it’s not! Yes that’s fine. You’ve credited me and pointed everyone towards my blog so Im happy with that. Hello! Thank you for your comment and welcome to my blog! I shall email you my details. It is very kind of you to think I’m of interest! Thank you and welcome to my world. Well you’ve got a great solution to dusting there, just stick some feathers on the end of the swords and they could dust whilst you vacuum. Who said I couldn’t do cleaning tips as well eh? Thank you and welcome! That’s ARnie, our laid back cat with a stump for a tail. We love him! I LOVE your blog. 🙂 I think it’s awesome that you can take simple things and find one thing to draw everyday. Life is so great. I look forward to viewing your blog in the future. I seem a bit late to the party, but better late than never, as they say! And I’m now a subscriber too… Don’t do that often, either. Never too late and all that eh? Well thank you very much for subscribing! I hope you continue to enjoy. Congrats on being Freshly Pressed 🙂 Although it looks like this should have happened sooner. I love the drawings. Kids do the funniest things. I found Blurb.com which allows you to publish your own books (I’m working on a cook book amidst the other million things), maybe that would help you. These are great drawings Angie – you have a very particular style which I think really suits the subject matter. I take my hat off to you for finding time in your day to do these – I’m trying to find more time for artistic pursuits myself and it’s always a struggle. They’re a delight to look at and I will certainly come back to see new one’s and to enjoy more of the sketches already here. Well done – keep it up! Thank you so much and welcome. When you make it part of your day, it becomes something you look forward to. It also has a knock on effect on your own creativity so draw as much as you can, no matter how tired, it will only get better and better. I love it! It’s funny and smart. I’m on the other side of the world and I can almost hear the voices of you children. Photos are great record keepers but nothing can capture the emotion and joy of a family like art created by a parent. The moments you capture of your family will never happen just that way again and for you to share that with others is so generous. I have been so busy caring for my kids, I almost forgot to care about the time I have with them. You have inspired me to pick up my pencils again and take a look at what I have. thank you1 GO FOR IT!!!!!! I appreciate creative people like you, and the masterpiece as well. So don’t worry, I won’t reproduce them. I will just show them to my family. Hi Doodlemum, I wrote a children’s story and wanted to get it illustrated. I’d be interested in your fees per illustration, if that is something you do. Do you have a site that lists information of this nature? Oh boy, I wish I could draw as well as you do. Your pictures are definitely worth more than a thousand words. There is just something so endearing about them…must be because they are drawn with love 🙂 thanks for sharing and so glad I found your blog! Just stopped by to browse some more;) Your sketches are just so good, I think you should do a comic strip or something! just discovered your blog and i wanted to tell me that you are my idol! i am raving about your blog on my blog tomorrow, i hope that is ok! That’s a start! Now go grab some paper and some pens and have a go, we all started somewhere, it’s a case of practice, practice, practice. Have a look at my earlier stuff, see how it’s changing? I think the best way with drawing is to just make a start with an idea in mind and see where you get to…drawing evolves and no drawing is ever the best, it could always be better. But I just can’t draw. I take the pen, and all that comes out is this weird shaping. Weird shaping’s better than a blank page…. Well, thanks anyway – I might think of trying to learn again. You still continue to produce one of the most enjoyable blogs around! Please keep up the fantastic work! I LOVE, love, love this. I often get very torn between writing and drawing and end up doodling and sketching, and then scribbling words in the margins of my sketchbooks. I love your visual representation of your life and motherhood!! Gruff with the magnifying glass had me cracking up!!! You do childhood its due justice. Great work. So glad I followed a post on facebook, to find you 🙂 amazing talent – definately turn it into a book / calender etc, id buy it for myself, my mum and fellow mums. 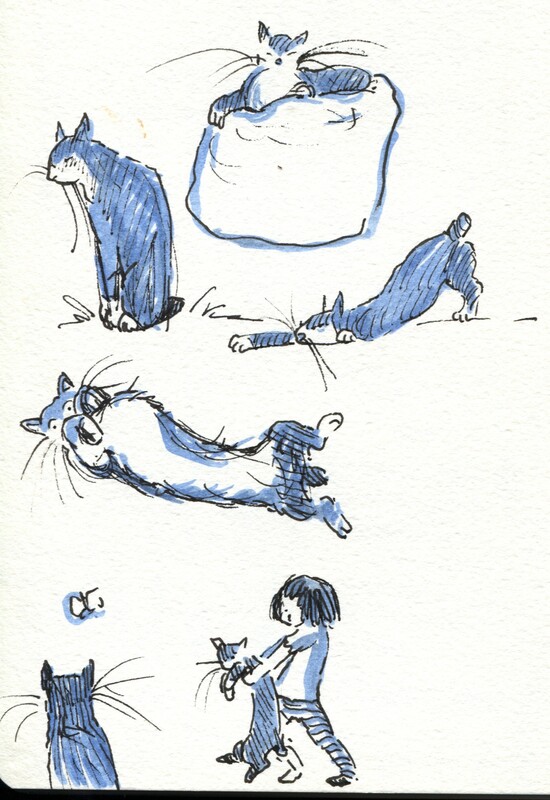 Your art is reminiscent of Quentin Blake, one of my all-time favs! This blog is beautiful and fantastic. Thanks for the inspiration! 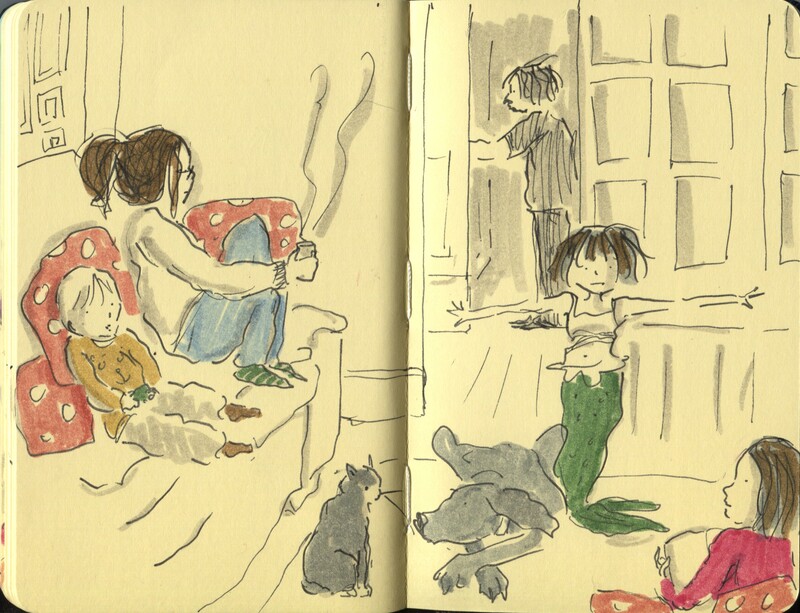 Hi Doodlemum, mentioned you in our blog today: http://peachfarmstudio.wordpress.com/2011/12/21/sketchbook-love-unite/ Keep up the great sketches! Hi Angie, I’ve got a prize for you! Would you like to come to collect it? absolutely love your drawings!! Is blogging easy? I did notice lovely, and I’m sure I thanked you for it at the time too. I hope you weren’t too miffed that I didn’t participate in the carrying on of the award scheme. You are right, I don’t take part in such schemes but it wasn’t meant to hurt your feelings. I really don’t mind if you didn’t carry on the award scheme, but I would have really appreciated a little comment from you at that time. I’m absolutely sure the only comment from you I have on my blog is the one you left 2 hours ago. Never mind, I know you are very busy with your large family. I didn’t take it personally even if I would have loved a notice from you (at least for education). Anyway, I still keep loving your blog and your drawings. What kind of supplies do you generally use to make work? I use Moleskine sketchbooks and faber castell pitt drawing pens. OOHHHH how absolutely delightful! I´ve just stumbled across your blog for the first time and I´m seriously impressed with your talent for drawing. I´m hopeless at it – can´t even draw a straight line with a ruler! Great job, well done. Thank you and welcome! I’m no good with straight lines either, I gave up on them a long time ago! Just stopping by to say, that seeing your posts always makes my day. You capture wonderful honest moments from life as a Mom. Amazing drawings that will stay with you for a lifetime! Brilliant! brightens up the day. I just landed here from The Daily What – this is fantastic. love love love what you’re doing. I always wanted a daily photo of our two, but my husband’s idea was 36 shots on one day, pick the best and don’t take any more for six weeks! (or months) If only I could draw! Thank you so much for letting us share your life through these enchanting sketches! Hi Angie just stumbled on your blg I think its fantastic ,Its so lovely to let you share your life with us a typical organised chaos lovely just love it keep it up .Im now an avid follower.Love Cilla Lewis Cardigan West Wales. Using ( Mike my partners FB account page. Loving your doodles Angie, I had (have!) three children now in their 20’s but your blogs bring back many memories. It may seem hard to kep this up but it is the day to day happenings that are worth recording to look back on. You made me realise I did enjoy the children growing up and miss those times. I am glad you are making the most of it! I just saw you on Breakfast TV and was captivated. Your pictures are great. As a Mum I can totally relate to the moments you have captured. Funny and wise. Saw u on bbc breakfast lovely drawings, we need cards/notebooks/mag-bags/ calendars etc..!!! merchandise!! Hi Doodlemum, just seen you on the telly and laughed. Love you doodlings remind of the Roald Dahl books. More power to your pencil. Fantastic – loved you and the kids on Breakfast, and your drawings are such a wonderful way of capturing a growing family. My 2 are now 21 and 18 (yikes, where does the time go!) and I enjoy looking back at the photos I took of them over the years. Wish I could draw like you, your pictures capture such emotion and – yes- love. I am a very-ish senior citizen Mum. I have just seen you on the tele with your lovely family and couldn’t wait to get onto your site. I was very comforted when I saw Outnumbered and realised our crazy family was not just us and now having seen your lovely drawings has made me realise there are hundreds of families like us out there!! I do hope you have luck in publishing – I am up to adding another book to my collection. Just shared on FB hope its ok! Just found you via the BBC – I love your style, it’s so simple and loose and lovely. Your illustrations remind me a bit of Bob Graham, who I also love – he also depicts family scenes with lovely little details all over the place. Have you ever read “Let’s Get a Pup!”,”The Trouble with Dogs” or “Dimity Dumpty”? Anyway, please keep up the great work! A book please- you sum it all up so beautifully! I just recently saw you on tv the other day and have to say I absolutely love what you are doing! A picture can certainly tell a 1000 words and yours are fabulous! I wish I had your talent, as it is a much more interesting and humorous way of recording daily life. Your children and their children will treasure your drawings for years to come and what a wonderful gift that will be. Thank you for allowing us..to peek into your world 🙂 How fab is it that you have this great talent…that allows you to share the trials an tribulations of day to day life…most enchanting really…and I bet thise drawings we find most amusing…were the toughest days.. to get through haha..Beautiful work..Thanks for the smiles.Iam a former educator/working in orphanages/children`s cancer wards/kindergardens..and i doodled a bit myself often to..unload the often hard loads of a day..but just not got the ability…to make it work. Best wishes and Love to you and yours ! High-calibre doodling indeed! I saw you on BBC Breakfast and was struck by your work and your story. Keep up the great work and spreading the word about the power of drawing! I love your blog and your drawings. What a wonderful way to capture your family moments. Thank you Pamie! Welcome aboard! Hi Angie! Love your drawings and I think it’s great you are getting so much exposure. I mean I am all the way in Canada – the web is great isn’t it!. I hope you think about doing a book – it will be a best seller! Hi Doodlemum. Love the blog, reminds me of my hectic scedual. Feels good that I can come here and get a funny spin on things and loose my self in your blogs. I’m a new mom and an elementary school art teacher. I can’t say how much I enjoy looking at your blog at the end of the day. I think your illustrations are just charming and whimsical with their own beauty. Thank you for giving me a smile on my way to bed. Keep it up! I love your pretty doodles very much! I draw and post on my blog too! I would like to ask what did program did you use to draw it? Thanks! I use pen, paper and just scan them in. I like your drawings so much! Thanks for sharing this with us. Thank you Gail and welcome! I’m so glad you do, it’s the little silly things our kids do that are sometimes the most precious. My first Doodlemum book is out at the end of February 2013 and will have lots of lovely pictures in! Welcome! I hope so too! I enjoy your posts and look forward to reading them. Keep up the great writing. This must be your 1’234’239’423th Versatile Blogger Award, but I’m giving it to you anyway ;). I understand that you don’t participate in these awards anymore (and I don’t ask for it), but I hope I still could show some of my appreciation through this. These are absolutely terrific! You have a rare talent. Bravo! You make me smile Angie. Thank you. I was drawn (no pun intended) to the funny illustrations which led me to read the article in Family Guardian all about you discovering your drawing and a bit yourself again…I really indentify with ” you have three healthy kids (I do) and they are doing well, but you feel an utter failure (yes! Most of the time)” . My dream is to rediscover my creativity, feel like a whole person again and, most importantly start enjoying my family. Thank you Angie for being honest, for giving me hope and the lovely drawings which make me smile and cry all at the same time. Hi, I’ve just been reading Family Guardian too, and really enjoyed your illustrations. I’ve just sent your website to my 26 year old daughter – she has 2 cats and hates going to work on Mondays, so I think she’ll love them too! Good luck for the future, you have a great talent. This is such a brilliant idea! Really genius! 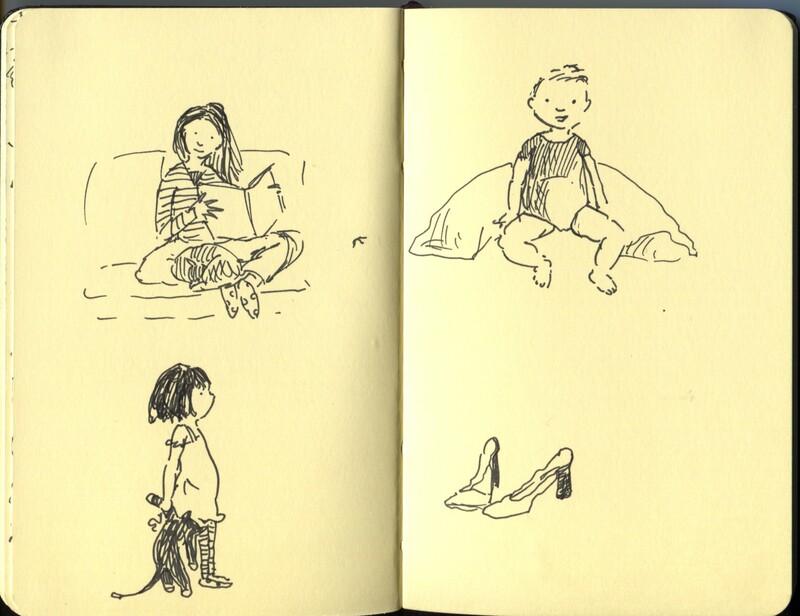 I love your doodles/sketches of your family life – it’s so amazingly unique and more interesting than just taking photos all the time. Love your humor, too! I really love your blog. Your drawings are just brilliant and make me smile so much even after a long day! Lovely stuff! A little something to say thanks for your blog! I Love it!! Wow I absolutely LOVE your Blog! It is such an original and amazing idea! I am so glad I came across it. I am very jealous of your talent, you’re an amazing artist! I can’t tell you how much I love your blog. I really related to your drawings. It’s so fun! The illustrations are brilliant, you are very talented. your blog is absolutely charming and refreshing! I love your doodles, they are lovely! I absolutely love all your doodles! So fun! Love your blog. Getting addicted to it. i love your illustration style! Hey im 10 I was hoping in the near future you could put a link to my site thankyou. I came across your blog in recommended and I love it! What do you use to draw the pictures? Your Pictures are just *L*O*V*E*L*Y* !!! Look forward to the next coming. Really awesome sketches. Very catching! Love your art work, am definitely following best wishes Charles. i stumbled across your blog and LOVE it! I can’t wait to view more. Fantastic art!! I am here via Toemailer, glad to have found you! What beautiful work. I’m glad you found an outlet for the difficult days in parenting and we all get to see the results! I love your drawings. They are so expressive and recognisable. Thanks for keeping such a wonderful blog! I just discovered your blog from looking under my recommended blogs, and I’m so glad that I saw it! Your illustrations are so cute and charming! They have a classic look to them. 🙂 Very inspiring! These are beautiful illustrations…very sweet and whimsical~ So glad I stumbled upon this blog. Keep it up! Awesome blog! Great drawings and incredible talent! Hi,I’m Renee and I saw a picture of a lady reading a book and a cat. I’m interested in seeing more pictures like that.I can’t seem to find any,I would really like to purchase that photo for my aunt.She reads a lot and loves cats. I showed her that drawing and she fell in love with it like I did. Please get back with me. Thank you. I love your blog!!! You are so extremely talented and I can relate to many of your sketches!! Brilliant!!!! Amazing sketches. You have a great talent; they look so pro and cute! Just stumbled upon your blog, made me grin! I love your sketching style! 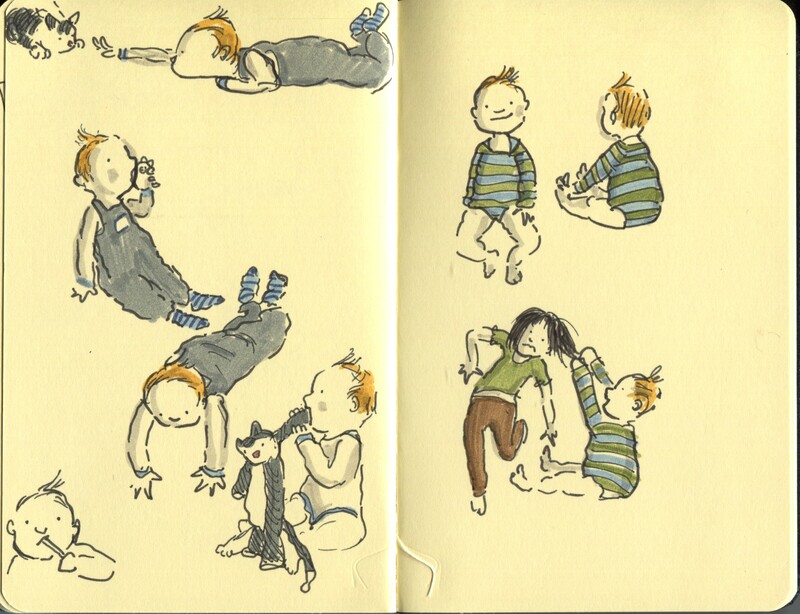 Love your illustrations they remind me of Quentin Blake’s style. I just stumbled upon your blog now so will keep reading! Love your blog! Your illustrations are awesome! wow …your drawings are very cute…. very commendable and very impressive.. I love your drawings, they are amazing!!! I am a mom of 9 so I completely understand the craziness and wonderfulness of raising children. That is awesome that you found something that you love to do and have been successful at it! Congrats. Great blog, and I love your daily sketches!!! Just happily stumbled upon your blog. glad something so positive came out of your PND. keep doodling! I love this. Can’t wait to see more. OMG! I found your blog quite by accident somehow, and I think it’s wonderful! I’m a married man, with a 33 year old son, and I started drawing about 4 years ago. I think your sketches and comments on your life are simple and wonderful and profound, and I LOVE them! I’v just ordered your book on my kindle too, and can’t wait to read it now! Please keep doing this blog, and make another book, and maybe a film, it’s BRILLIANT! Wow, just come across your blog, and it’s beautiful! So different to other sites I’ve been looking to follow. Can’t wait to receive my updates. Doodlemum, I just came across your blog while hunting for drawings of hens online. I also raise chickens, you see (sheep and donkeys, too), in Orangeburg, South Carolina. I love your illustrations, delightful. Glad to have found you. Doodlemum, I adore your page. I just came across it while on Google searching for illustrations of hens. I, too, raise chickens (and sheep and donkeys), out in Orangeburg, South Carolina. Hope all’s well.